Cook 8 slices of bacon until crisp. Chop bacon & set aside. Add 2 cloves of minced garlic to the skillet & saute about 30 seconds. 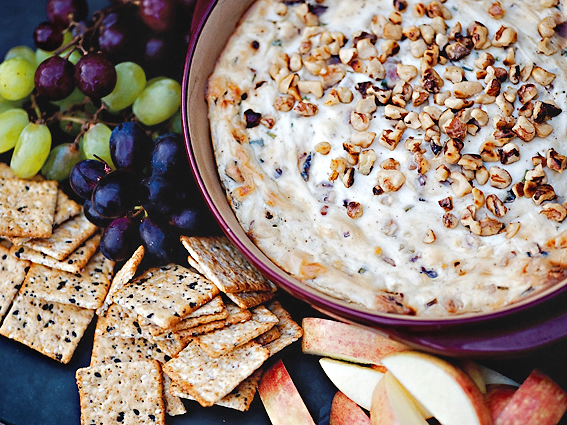 Divide 1-1/2 oz of Brie evenly among 12 store-bought prepared mini phyllo shells. Bake on a sheet pan at 400 degrees for 5 minutes. 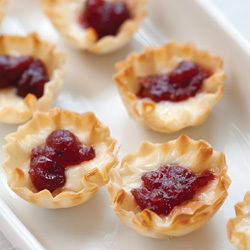 Put a dollop of cranberry chutney or jam on top and serve. Spread softened cream cheese on ham slices. Drain pickled okra on paper towels. 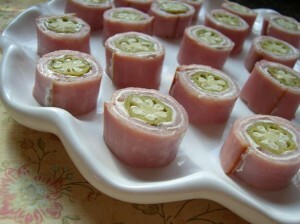 Cut off both ends of the okra and roll up in the ham & cheese. Wrap tightly in plastic wrap & chill. Slice & serve. Mix together 3 cups of Bisquick & 1-1/2 pounds of sausage (you can use hot or flavored if you like) & 10 oz of sharp cheddar cheese. Make into balls & bake at 350 degrees for about 25 minutes. 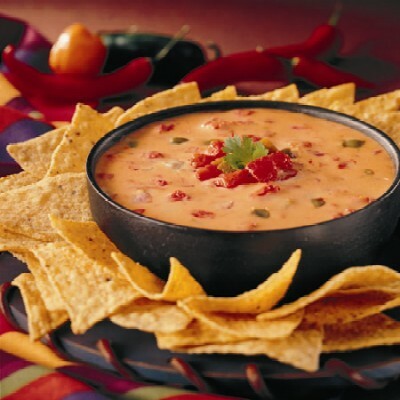 Combine 1-10oz can of diced tomatoes & green chilies & 2-16oz packages of Velveeta cheese. Add some garlic powder. Heat on low and stir until cheese melts. Add 1pd ground beef, cooked & drained. Mix & serve. Bring a large pot of water to a boil. Add salt to the water and Old Bay Seasoning. You can also add a lemon cut in half and squeeze the juice into the pot. When the water is boiling add large shrimp with the tail and shells on. 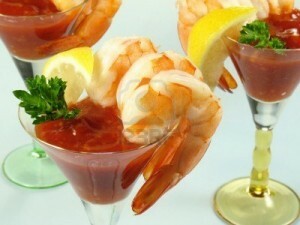 By the time the water starts boiling again the shrimp should be pink & floating to the top (about 2-3 minutes). Put into a bowl with ice water. Shell & serve with cocktail sauce (A mixture of ketchup, horseradish, relish, lemon juice, hot sauce & a dash of worcestershire sauce). Mash ripe avocados with a fork. Keep it lumpy. Add chopped onions, fresh chopped garlic, chopped tomatoe, cilantro & lemon juice. 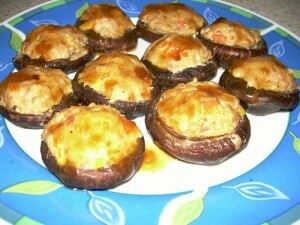 Remove the stems from 16oz of mushrooms. 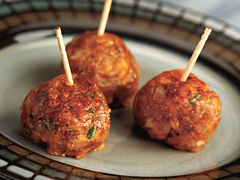 Brown 1 pound of sage flavored sausage & 1 small minced onion & the chopped mushroom stems. Drain the sausage mixture & add 1-8oz package of cream cheese & stir until it melts. Stuff the mushrooms with the sausage mixture & place on a cookie sheet coated with cooking spray. 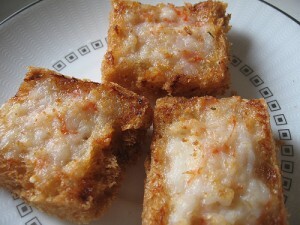 Bake for 30 minutes. 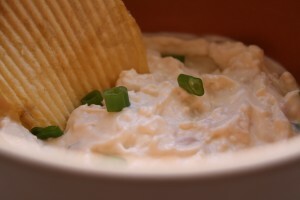 Combine 6oz of cooked & chopped shrimp & 1 cup of mayonnaise with 1 cup of shredded cheddar cheese. Spread the shrimp mixture on white bread, trimmed & cup in squares.